One of the city�s most beautiful contemporary hotels, located in the middle of prime Fifth Avenue shopping, & just one block from Central Park. The guest rooms are truly state-of-the-art, bursting with amenities, providing panoramic views of Manhattan. The lobby is an inviting public space with great seating areas to relax & enjoy celebrity-watching. The Peninsula Spa & Fitness Center has been voted the commanding view of the Manhattan skyline, & includes a long list of body, nutrition, fitness, & massage services. There is a gorgeous glass-enclosed swimming pool on the property & a full-service unisex beauty salon. Fives, the signature restaurant in the hotel is perfect for winding down after a day of shopping on Fifth Avenue. The restaurant's stylish ambiance creates a comfortable and relaxed setting to enjoy the Contemporary American cuisine. The Bar at Fives has a large selection of wines by the glass and provides a beautiful backdrop of the city. The dramatic rooftop terrace, Salon De Ning, provides stunning views over 5th Avenue and is great for private events. 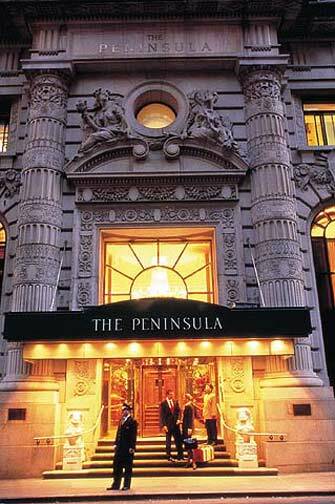 The Peninsula�s banquet facilities can accommodate up to 180 people.